Bill grew up in Shamokin, Pennsylvania, and graduated from F&M College; he served in the Peace Corps in Sierra Leone before studying pottery with Charles Counts at Rising Fawn, Georgia. Bill and his wife Sharon moved from Chattanooga to Penns Creek in ’78 where they established Penns Creek Pottery and raised two wonderful kids, Ben and Emily. 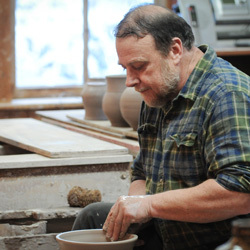 Bill wholesaled and sold his pottery at shows until he restored Sampsel’s Mill in 1989, when the old mill was repurposed as a place where pots are made and sold to the public. 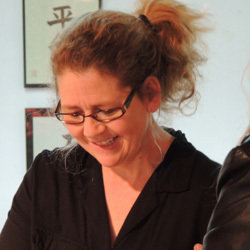 Wendy comes from Woodward, PA, and is a descendant of a 19th century jug potter who made his pots in the mountains of Center County, Pennsylvania. Not only is Wendy an excellent potter, she has many other talents: weaving,dog grooming, and baking. Wendy is a pastry chef, and has her own seasonal baking business that produces some of the best cookies you’ll ever eat. Wendy has made pots with Bill at Penns Creek Pottery for 26 years and has been a very important part of Penns Creek Pottery. Jane grew up in West Chester, Pennsylvania, and comes from a Quaker tradition. She attended Westtown School where she first made pottery with Ellen Brown. After studying at West Chester University, she began working with horses on a Chester County farm where her specialty was equine reproduction. Jane was happy to move to Union County where she raised her two girls and worked in food development at Walnut Acres Organic Farm. She is committed to organic gardening and to her work at the Natural Food Store in Lewisburg. She has made pottery with Bill for 18 years and has also pursued her interests in glaze development. 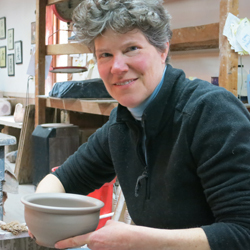 She is responsible for some of the beautiful glazes to be found at Penns Creek Pottery.